Now a war of words escalating between India and China over Tibetan spiritual leader Dalai Lama For Hosting In Arunachal Pradesh, Chinese media on Thursday warned that Beijing could engage in a geopolitical game with India. 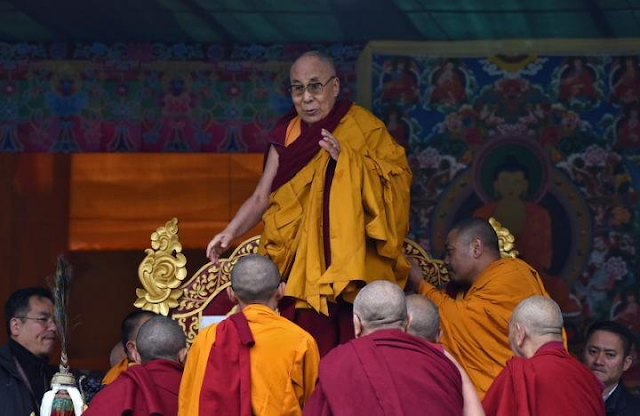 The Dalai Lama's week-long trip to Arunchal Pradesh, an eastern Himalayan region administered by New Delhi, but claimed by China as "southern Tibet", has raised hackles in Beijing, which labels the monk a dangerous separatist. A reaction from the Chinese media comes a day after China lodged a protest with India's Ambassador in Beijing Vijay Gokhale for "obstinately" allowing the Dalai Lama. Stating that with a GDP several times higher than that of India, military capabilities that can reach the Indian Ocean and having good relations with India's peripheral nations, state-run Chinese tabloid Global Times asked, "Coupled with the fact that India's turbulent northern state borders China, if China engages in a geopolitical game with India, will Beijing lose to New Delhi?" China said on Wednesday that India's decision to host Tibetan spiritual leader the Dalai Lama on a contested stretch of land on the India-China border would cause serious damage to relations between the two countries. "China expresses firm opposition to this and will lodge stern representations with the Indian side," foreign ministry spokeswomen Hua Chunying told a regular briefing in the Chinese capital. The 81-year-old Buddhist monk and Nobel peace laureate had planned to fly by helicopter to the 17th-century Tawang monastery and hold three days of spiritual teachings starting on Wednesday. However, heavy rainfall forced him to travel by road - a two-day drive through rugged mountain terrain - and he is not now expected to arrive until Friday. The Dalai Lama received a rapturous welcome on Tuesday in the town of Bomdila, with large crowds turning out in streets festooned with flags, as musicians and dancers clad in traditional costumes performed before his sport-utility vehicle. Later, the maroon-robed prelate walked slowly through the crowds, a fellow monk supporting him by the arm and another holding a large umbrella overhead to shield him from the rain. Indian officials have dismissed China's criticism of the Dalai Lama's second visit to Arunachal Pradesh in eight years, saying he is a spiritual leader who has a devoted following in the region. "His visit to this part of the country is totally religious," the state's chief minister, Pema Khandu, told Reuters Television. "As far as the boundary issue is concerned, I have also maintained that we don't share our boundary with China, but we share our boundary with Tibet." China has repeatedly criticised visits by foreign officials to Arunachal Pradesh, which it calls South Tibet and over which it has a long-standing claim. In its latest broadside, Beijing said that by ignoring China's concerns and persisting in arranging the trip, India had "severely damaged China's interests and China-India relations". "We demand that India immediately cease using the Dalai Lama's mistaken behaviour to damage China's interests," Hua added. "It will not bring any benefit to India. China will take necessary measures to firmly safeguard its territorial sovereignty and legitimate rights." The Dalai Lama fled in 1959 over the border not far from the Tawang monastery, the largest of its kind in India. At the start of his tour, he was reunited with an elderly Indian border guard who had helped him to safety. He now resides in the Indian hill town of Dharamsala, where his supporters also run a small government in exile. 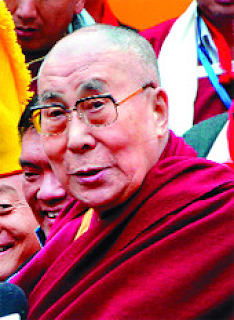 He has renounced any political role in leading the Tibetan diaspora. The Indian government has rejected China's criticism of the Dalai Lama's visit - his first to Arunachal Pradesh since 2009. "The government has clearly stated on several occasions that His Holiness the Dalai Lama is a revered religious leader, who is deeply respected by the Indian people," it said in its latest statement on the matter. "The government, therefore, urges that no artificial controversy be created around his present visit to Arunachal Pradesh." Now a war of words escalating between India and China over Tibetan spiritual leader Dalai Lama For Hosting In Arunachal Pradesh, Chinese media on Thursday warned that Beijing could engage in a geopolitical game with India. The Dalai Lama's week-long trip to Arunchal Pradesh, an eastern Himalayan region administered by New Delhi, but claimed by China as "southern Tibet", has raised hackles in Beijing, which labels the monk a dangerous separatist.